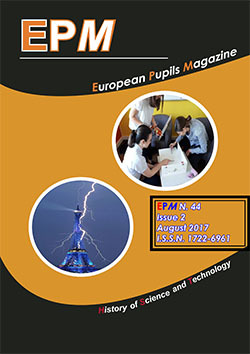 EPM Italian Editorial Board asks you to submit us articles about history of science and technology to be published in the next number of the EPMagazine. YOU COULD WIN A TRIP TO A EUROPEAN COUNTRY FOR TWO PEOPLE (the pupil and the referred teacher). For further information feel free to contact me at the address epmagazine@virgilio.it and/or visit our official websites: www.epmagazine.org and our official web-magazine www.liceoboggiolera.it/epm. Contributing to the EPMagazine you could be the winner of EPM Awards 2006. You only try to write the best article of the year and the next journey to a European city could be yours.